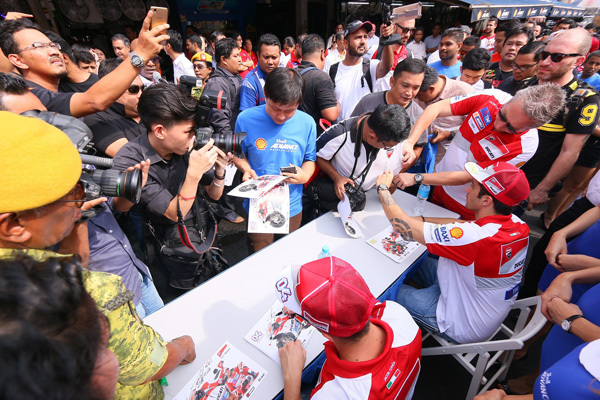 Kuala Lumpur (27 October 2016) — Shell Advance treated Jalan Sentul workshop owners and customers to a Ducati Team spectacular with an unprecedented VIP visit from its Technical Partner’s Sporting Director Paolo Ciabatti and the team’s top riders Andrea Dovizioso and Andrea Iannone. As a gesture of appreciation for their loyal support, eight lucky workshop owners – who have helped to make Shell Advance the leading motorcycle engine oil brand in Malaysia – experienced the memorable occasion with their customers at the ‘golden mile’ area popular with bikers in the Klang Valley. 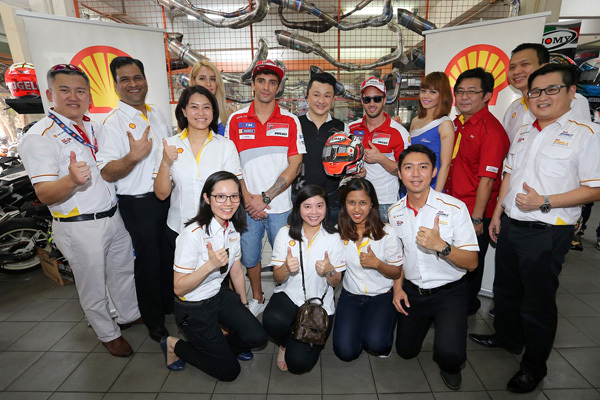 Accompanied by Shell Advance Global Brand Manager Vivek Pareek and the Shell Lubricants Malaysia team, Ciabatti, Dovizioso and Iannone spent time at each of the eight selected workshops to chat with owners and pose for photographs. 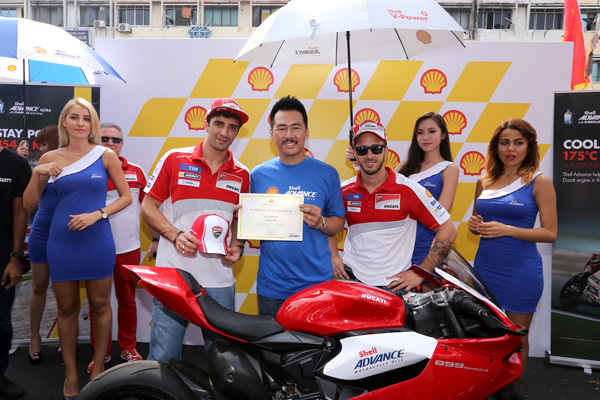 They also handed over mementos as a thank you for recommending the Shell Advance range of premium motorcycle engine oils that are developed with Ducati in the extreme test bed of MotoGP™ to ultimately benefit everyday riders around the world. Ciabatti, Dovizioso and Iannone also took the opportunity to present prizes to the top three mechanics who took part in a special ‘fastest bike oil change’ challenge that was organised in conjunction with the visit. The upcoming 2016 Shell Malaysia MotoGP™ will be a ground-breaking occasion. In conjunction with the premier international motorcycle racing event in the region, Shell Advance will also be conducting a free oil change for 500 motorcycles from 9.00 am to 6.00 pm on Saturday, October 29 and Sunday, October 30, 2016 at P1 Parking Lot at Sepang International Circuit. This first-ever free oil change for owners of motorcycles below 250cc will be given to winners of a recent Shell Advance competition and also to owners who purchase a pack of Shell Advance engine oil during October 29 and 30, 2016. For more information on the latest Shell Advance products, please go to www.shell.com.my/advance.